Congratulations! River Life has won the 2014 Moonbeam Children's Book Awards Gold Medal in the Environmental Issues category! From a small stream in a Pennsylvania woodland, this book follows the seasons of river life along three connected rivers: the Allegheny during spring, the Ohio during summer and the Lower Mississippi during fall. What animals and plants will you find along the river's edge? How do the changing seasons affect the insects, flowers and birds you might see? Why do some of the fish and other animals found in the water live among rocks and gravel while others are found in sandy or silty areas? River Life: A Journey from Headwaters to the Sea is a great book for river exploration, even if you never leave home. In addition, the table of contents, glossary, list of scientific names, river facts of the world and index make this book an excellent educational resource for classrooms and home schooling. 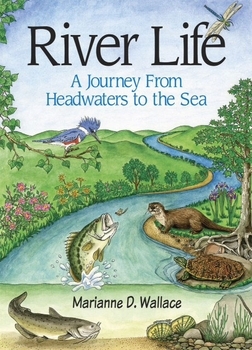 Marianne D. Wallace is a writer and illustrator whose work has appeared in over 30 nature-related publications, including eight books for children. She lives with her family and pets in the mountain foothills, sharing the backyard with native plants and the deer, squirrels, bears and other wildlife that roam through the area.